No, they won’t be right back. Their engineers went fishing and, from what I hear, won’t be working on the issue anytime soon. The Yahoo Finance API is dead. 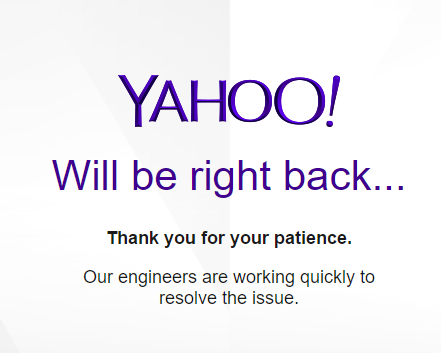 Without prior announcement, Yahoo has abandoned their only remaining service that was clearly ahead of the competition. This script downloads the data with the Google API. When you afterwards start the script with the Yahoo download, it will detect that the data is already there, and not access the Yahoo API. Like the Yahoo message, this one is also wrong, but in a more positive sense. The Google Finance API is still available and was so for years, but nobody knows how long it will remain. For the moment, the above script will do, but it’s only a temporary solution. Free stock data can alternatively be downloaded from Quandl with a similar script, but for ETFs they want 50 bucks per month (I hope they didn’t bribe Yahoo and Google into abandoning their APIs!). I’ve added the above script to the 2017 repository, in order to make all the Yahoo accessing scripts work again, although with slightly different results. You’ll need the current Zorro version 1.58 or above. And if you know a free and reliable API for ETF EOD history, please post a comment! Google historical data API has shut down now too. I needed full historical EOD data (which Google provided before) but most API’s may only go back 10 or 20 years. The best solution for me was https://www.worldtradingdata.com. Most tickers go back to near their IPO (AAPL for example goes back all the way to 1980-12-12). Hope this can help some others too. I have found no “Free” alternative to what Yahoo was. AlphaVantage has gotten worse by the week. Some days/TOD it’s fine for most calls, others it’s not worth connecting. Response time does not perform has they indicate most of the time. Perhaps it’s growing pains, but would be a lot more reassuring if they were a lot more forthcoming about themselves. They all have much more limited datasets (markets/symbols/fields) when they do work. Thanks to your work on this blog, I found my own solution. I blogged about it here, but I’ve included 3 links just in case any go down. I wrote my first script that deals with working with cookies. The sp500 is used as a based in portfolio management, but there are no direct csv links. They all redirect using some sort of cookie. I read about extracting a crumb from some other urls, but they were all in different languages. I’m on windows and I really didn’t want to branch out of batch. GNU tools are one thing, as that’s whats on linux. Anyways, lucky for me, other sripters think like me and they utilize gnu as well. So I figured how to compartmentalize the commands by making them into mini batch files, and I was able to extract the cookie and crumb and download the SP500 so I can use it as a index for portfolio management. Anyone knows how to use Stooq or IEX to download data for Indian stocks? Like INFY.NS PNB. (all symbols from yahoo) NS, NSEI NSEBANK etc? As you know, Alpha Vantage has adopted a commercial license scheme, quite expensive in my view. Their free version officially delivers only up to 5 quotes per minute, although my testing shows that api calls are often rejected even when they are placed less frequently. In general, feed acquisition is not stable and unexplained erratic intermittent failures occur. I have upgraded my Excel Deriscope addin to cope with these “anomalies” by placing feed requests on spaced 20 seconds intervals and filtering out any received bad values. All-in-all Deriscope allows you to have – let’s say – 30 stock tickers and have a constant stream of price quotes (received on 20 sec intervals) that will be no older than 10 minutes (30 tickers * 20 seconds = 600 seconds = 10 minutes). I appreciate suggestions, preferable free, where I can mix data from stock information and from options information. I would like to have like closing price and daily volume for stocks and also have how much volume the stock received in the options market and open interest. I have been using Deriscope to get live stock prices in Excel. It works with various live feed providers, including Alpha Vantage. I like in particular Deriscope’s ability to fetch stock prices in the background at a rate that is allowed by Alpha Vantage free usage restriction of 5 api calls/minute. I use Deriscope’s default setting of 3 calls/minute so that no bottleneck ever occurs. My monitored portfolio consists of 18 non-US stocks, which means I get a full price update every 6 minutes. This is good enough for my purposes. With my US stocks I use the Deriscope-supported IEX live feed provider, who sends true real time prices with zero time delay. I don’t know if you have noticed, but Yahoo Finance has returned with its free live feeds service. Yes, I noticed that the latest Zorro version also supports Yahoo again. What is the API used to get the Yahoo data? The one I was using before hasn’t started working again. For instance, https://in.finance.yahoo.com/quote/AAPL/history?p=AAPL. That’s no API, but a website with historical data. Load that website in your program and parse the data out of it. It’s in JSON format embedded in the HTML code. Start and end date can be added to the URL in unix time format. It’s worth noting https://polygon.io if you’re looking for the entire CTA feed. Most of the free APIs are IEX only which is <5% of market volume. Any thoughts on solutions for outside of the US ie: LSE, TSX, ASX? LSE is supported by Yahoo. I don’t know if TSX or ASX, but just try. who said IEX does not provide intra-day open, close? It does and actually provide much more than that. A total of 20 fields, including the timestamps. Minute-by-minute! My apologies for not finding this forum earlier, it would have made everybody’s life easier. Don’t be mad. Yahoo financial data is still available, in fact its much better than it ever was and it is accessible by everybody, you just need the right tools. Yahoo simply switched from CSV to JSON format, which is way more flexible for them. Over 150,000 stock symbols on 82 exchanges–that’s a lot of data. I have created some tools at http://www.signalsolver.com to help you with the transition. The first emulates the old Yahoo URL for getting historical stock price data and gets around the cookie issue. The second imports historical price data into Excel using the JSON interface, including one minute delayed prices. These are both free. Forgive me for shamelessly promoting my own creations, but I thought this information may be add value to the discussion, and I don’t want people feeling badly about Yahoo when they are just keeping up with the technology. We need to do the same. – They are amateurs. Their starter code is not theirs and it is full of bugs. You better know how to program. – Their help pages are not very helpful and they make a ton of assumptions which may or many not be true or may or may not be applicable or may or may not be understandable. Obviously these people never wrote a technical document, much less a User Requirement Specification / System Requirement / Design Specification, etc. (if you are into software engineering). – Their support is OK, but it will take you a few tries to communicate with them; their english is not great (this is a French company). – Their API is average, but, they do not have useful “bulk” download options. If you want to download entire exchanges from scratch, you will have to do it one day at the time. – They are not sure when EOD the data will be ready. – Data may not be available EOD for… no reason. BOTTOM LINE: if you want cheap data to develop systems and you need a lot of it, this is a good option. Pay for a month or two, download everything and then develop your systems. Once you start trading for real, get a reliable data provider. Stooq recently did the Yahoo and ceased delivering historical data on stooq.com. But stooq.pl seems to be still working. So if you got data from Stooq, change the URL to stooq.pl. I would not care, but Stooq seems to be today the only reliable free source for UK stocks and ETFs. Yahoo delivers them too, but unfortunately with totally wrong prices – their connection to the LSE seems to be seriously broken. This also affects data providers that just copy their data from Yahoo, such as AlphaVantage.